We started Paleovalley to make improving your health and nourishing your body with nutrient-rich superfoods simple and hassle-free. Right now we're offering up to 30% off our best-selling 100% Grass Fed Beef Sticks. Right now we're offering up to 30% off our best-selling 100% Grass Fed Beef Sticks. Paleovalley 100% Grass Fed Beef Sticks are the only beef sticks in the USA made from 100% grass fed/grass finished beef and organic spices that are naturally fermented. WHY OUR BEEF STICKS ARE BETTER? This is what truly sets our beef sticks apart. We use old world methods of fermenting our sticks so they are shelf stable without the use of chemicals or questionable ingredients. Virtually all other similar snack stick products use GMO corn-based citric acid encapsulated in hydrogenated oils to process their products. Thanks to this fermentation process, each stick contains gut-friendly probiotics! We love making healthy products... but even more we love making healthy products that taste delicious. Our beef sticks are so delicious we actually guarantee that you'll love them... seriously! We created Paleovalley 100% Grass Fed Beef Sticks to make healthy snacking on clean, high-quality protein easy and delicious. Our 100% Grass Fed Beef Sticks are made beef from happy, healthy cows. They are NEVER fed grains. Unlike most companies using the term "grass fed" even though their products are NOT grass finished - we actually care about the quality of life the animals enjoy. Truly pasture-raised cows are, not surprisingly, much healthier than grain fed cows and contain higher levels of vitamins, minerals, and antioxidants. They also have a much more favorable omega-3 to omega-6 fatty acid ratio which is important because when omega-6 levels are too high inflammation is often the result. Not only does grass fed beef contain much higher levels of omega-3s than conventional beef, it also contains an ideal ratio of omega-3 to omega-6 fatty acids which is vital in helping control and reduce inflammation. 100% grass fed beef is one of the best sources of CLA. CLA exerts potent antioxidant activity. Studies have documented CLA’s ability to prevent diseases like cancer, diabetes and heart disease. 100% grass fed beef contains more calcium, magnesium, potassium, zinc, phosphorus, beta-carotene and iron than grain-fed beef. It also has higher levels of B vitamins – specifically (thiamin (B1) and riboflavin (B2), as well as the fat soluble vitamins A, D, E and K. These fat soluble vitamins enhance mineral and protein absorption and are believed to protect against cardiovascular disease. Glutathione is often called the body's "master antioxidant". It is a very powerful antioxidant that helps protect the body from oxidation and DNA damage. Conventionally raised, grain fed beef is indeed terrible for the environment. However, 100% grass fed beef helps to regenerate soil and grasslands which, in turn, helps pull carbon out of the atmosphere and put it back in the soil where it belongs. "Got mine in the mail today! They taste wonderful!! I've never really been big on beef sticks, but I absolutely love these. And to think they're healthy!!! Yay!" "These are fantastic!! Took them on a two week road trip and they were so handy to snack on when I didn't have time to eat a meal. The flavor is wonderful!!" A grass fed beef stick without all the extra "stuff" by Paleovalley. OMG. They are yum!!! What a great little snack to toss in your purse or gym bag. "I ordered, received and promptly tried one your beef sticks. They are incredible & perfect…I am so happy to have discovered them." Just got my order today for the first time. They are delicious! I ordered them and they are awesome. My kids love them also. 100% Grass Fed Beef – Never given grain. Given the incredible, well-studied health benefits of 100% grass fed beef, plus the fact that we naturally ferment them, our 100% Grass Fed Beef Sticks have already been a huge hit with health enthusiasts, conscious eaters, busy moms, hungry dads, and kids everywhere. Each pack contains ten 1 oz sticks and we recommend taking advantage of our bulk discount pricing so you can save more today. And keep in mind, if you have kids there is a very good chance this will be their new favorite snack so order enough that you don't start a house war over beef sticks! Also, when you order 4 packs or more you will receive FREE shipping and handling. Original: 100% grass fed beef, water, unprocessed sea salt, organic dextrose from tapioca (used to initiate the fermentation process), celery juice, organic black pepper, organic red pepper, organic garlic powder, organic coriander, lactic acid starter culture from non-GMO beets, stuffed in a dye-free beef collagen casing. Jalapeño: 100% grass fed beef, water, unprocessed sea salt, organic dextrose from tapioca (used to initiate the fermentation process), celery juice, organic jalapeño powder, organic chopped jalapeño, organic black pepper, organic red pepper, organic garlic powder, organic coriander, lactic acid starter culture from non-GMO beets, stuffed in a dye-free beef collagen casing. Summer Sausage: 100% grass fed beef, water, unprocessed sea salt, organic dextrose from tapioca (used to initiate the fermentation process), celery juice, organic allspice, organic coriander, organic nutmeg, organic white pepper, organic black pepper, organic mustard seed, organic paprika, lactic acid starter culture from non-GMO beets, stuffed in a dye-free beef collagen casing. Garlic Summer Sausage: 100% grass fed beef, water, unprocessed sea salt, organic dextrose from tapioca (used to initiate the fermentation process), celery juice, organic allspice, organic coriander, organic nutmeg, organic white pepper, organic black pepper, organic mustard seed, organic paprika, organic garlic powder, lactic acid starter culture from non-GMO beets, stuffed in a dye-free beef collagen casing. Teriyaki: 100% grass fed beef, organic raw honey, teriyaki style seasoning (sea salt, organic ginger, organic paprika, organic nutmeg, organic onion powder, organic fenugreek), organic dextrose from tapioca (used to initiate the fermentation process), teriyaki sauce (organic coconut sap, organic garlic, sea salt, organic ginger, organic cayenne pepper), celery juice powder, lactic acid starter culture from non-GMO beets, stuffed in a dye-free beef collagen casing. Our 100% Grass Fed Beef Sticks are shelf-stable at room temperature for between 4 month to 6 months. They do not need to be refrigerated but will last even longer if you keep them refrigerated. They can be kept frozen for 1 year - simply leave at room temperature to thaw and enjoy! No, these 100% Grass Fed Beef Sticks are free from GMOs, gluten, grains, corn, soy, and dairy. Are the livestock treated humanely? We often receive questions regarding how our livestock is harvested in a humane manner. We honor and respect the sacrifices our animals make to provide us with nourishment, and we want our customers to feel peace of mind knowing this sensitive process is handled with great care and respect. The facilities utilize design and animal-handling techniques developed by renowned animal welfare expert, Temple Grandin. Throughout all stages great care is taken to ensure humane and ethical treatment of our livestock so that our animals experience minimal stress and no pain. Additionally, great care is taken to utilize all parts of the animal because we believe in responsible raising and sustainability. 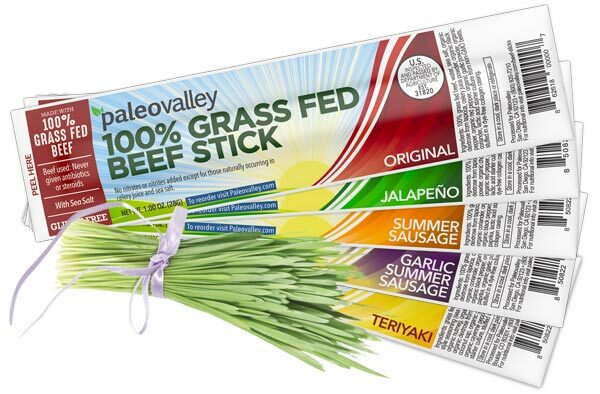 What makes Paleovalley 100% Grass Fed Beef Sticks better than other similar products? First off, we haven't found any other similar products. There are several "grass fed" beef sticks on the market but ours is different for three main reasons. 1. Our beef is actually 100% grass fed and finished while others often claim "grass fed" only to finish the cattle on grain for the last few months of their lives. This process of grain finishing is enough to negatively alter the biological makeup of the animal, causing a more inflammatory product with fewer vitamins and nutrients. 3. No encapsulated citric acid. This is where our beef sticks truly shine. 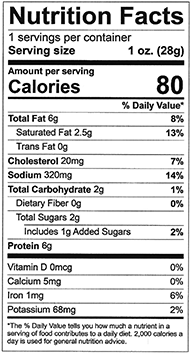 Literally every other similar beef stick on the market (yes, even the so-called "healthy" ones) contains an ingredients called encapsulated citric acid. While this may sound innocent enough it is actually a very health damaging ingredient used for nothing more than preserving the product. It contain citric acid (sometimes lactic acid) typically derived from GMO corn which is then coated with hydrogenated oil – an ingredient known to cause massive amounts of inflammation. Instead of using this ingredient we use old world style, natural fermentation to preserve our sticks. The result is a delicious stick that is much juicier than others and, thanks to the fermentation process, the presence of gut-friendly probiotics. our 100% Grass Fed Beef Sticks, simply by subscribing!